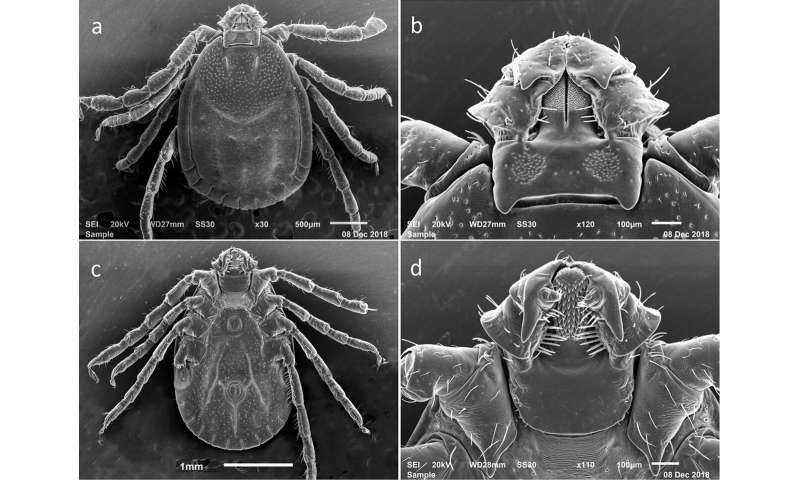 Scanning electron microscopy images of an adult female Asian longhorned tick, used in Rutgers' researchers new guide to identify the species. Credit: Andrea Egizi and co-authors. Rutgers researchers and other scientists have created a visual guide to help identify and control the Asian longhorned tick, which transmits a fatal human disease in its native countries and threatens livestock in the United States. The pest has been found across much of the eastern United States thanks to discoveries in which Rutgers University researchers played a key role. Scientists are now scrambling to determine how widespread these invasive ticks have become in North America. But it's a complicated job, especially since Asian longhorned ticks are nearly identical to two native species—the rabbit tick and the bird tick, which are mostly harmless to humans. Now, a collaborative research team including members of the Rutgers Center for Vector Biology has created a guide that makes it easy for anyone with a powerful enough microscope to tell the Asian longhorned tick apart from those North American cousins as well as a Central American species. The guide, published in ZooKeys, identifies tiny details—such as two triangular, hornlike spurs on the adult Asian longhorned tick's mouthparts—that set the ticks apart from each other. These details are visible on scanning electron microscopy images taken by the research team's collaborators. Female Asian longhorned tick on a leaf. Credit: James Occi, Rutgers Center for Vector Biology. "To begin to understand the threat posed by Asian longhorned ticks in the United States, we need to know the full extent of its distribution," said lead author Dr. Andrea Egizi, a visiting professor at Rutgers' Center for Vector Biology and a research scientist with the Monmouth County Tick-borne Disease Program. "We made this key so that researchers across the country have an easier way to identify them." The collaboration between Rutgers and Monmouth County led to the identification of the Asian longhorned tick in 2017, after a Hunterdon county resident discovered an infestation of ticks on a pet sheep, with later confirmation by the USDA's National Veterinary Services Laboratory. 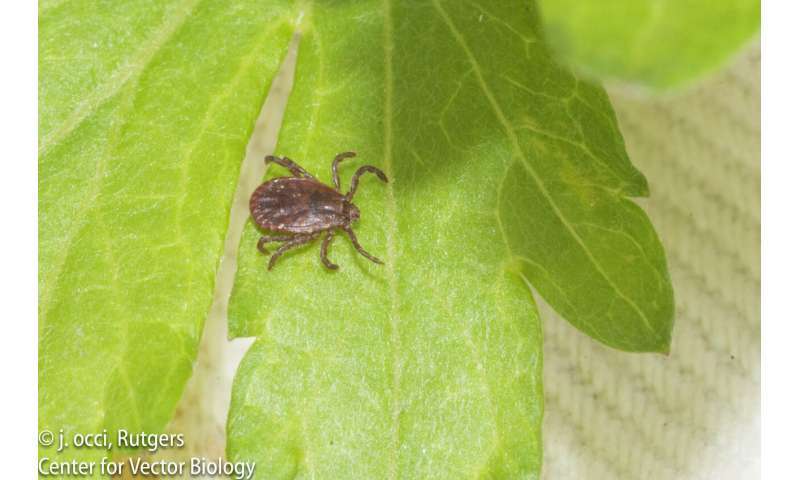 In April 2018, the group determined that the ticks had survived the winter in New Jersey. Asian longhorned ticks have since been found in Arkansas, Connecticut, Maryland, New York, North Carolina, Pennsylvania, Virginia and West Virginia. "We now know that the Asian longhorned tick has been present in New Jersey since at least 2013, but that first discovery, found on a dog in Union County, was initially mistaken for a rabbit tick," said contributing author Dina Fonseca, director of the Rutgers Center for Vector Biology. "We are hoping this visual guide will help us identify and control the expansion of this tick." Asian longhorned ticks are native to eastern Asia, where they transmit potentially fatal diseases to humans. They are an invasive and serious livestock pest in Australia and New Zealand. They reproduce asexually, meaning a single unfertilized female can produce many offspring without mating, allowing these ticks to spread rapidly.